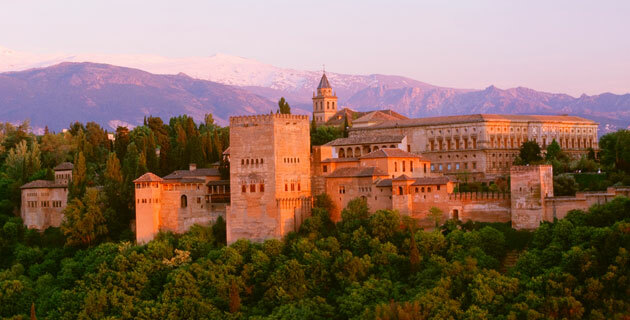 You’re invited on a distinctive small group journey through the Iberian Peninsula to the intimate lodgings of Spain’s paradores and Portugal’s pousadas: medieval monasteries, historic fort­resses, and stately palaces, each reflecting the spirit of its region. We feel the spell of Iberia’s rich Roman and Moorish past – and the pull of its vibrant contemporary life. Please call if your city is not listed or for land only prices. Prices are per person based on double occupancy and include airline taxes, surcharges, and fees of $683, which are subject to change until final payment is made. Situated a short distance from the historic city center, the Corinthia Hotel Lisbon overlooks Monsanto National Park. The 518-room hotel features two restaurants and an indoor/outdoor lounge, indoor swimming pool, gym, spa with massage treatments, complimentary Wi-Fi internet access, solarium, jewelry shop, and laundry and dry cleaning services. Air-conditioned guest rooms have private bath with hair dryer, mini-bar, tea- and coffee-making facilities, in-room safe, TV, and phone. A former 15th-century convent lovingly converted into a hotel, this building features fine architectural details including decorative arches, a marble staircase, a cloistered garden, and frescoed walls and ceilings. The Pousada dos Loios does feature a restaurant and laundry service. Small but comfortable guest rooms have been converted from a monastic cell, but you won’t need to sacrifice your comfort to enjoy it, because your room is fully equipped with modern amenities, including air conditioning and private bath with hair dryer, Internet access, safe, TV, and phone. The pousada has no elevators. Converted from a 14th-century Moorish castle and overlooking the scenic plains of Carmona, this hotel features Internet access, an Andalusian Courtyard with Moorish columns and a fountain, a stone-vaulted restaurant, laundry service, swimming pool, and garden. Your room is equipped with a private bath with hair dryer, air conditioning, safe, mini-bar, TV, and phone. Originally a medieval town hall, this parador boasts a stunning location on a cliff overlooking a dramatic gorge. It features a restaurant, Internet access, laundry service, and gardens with footpaths and sweeping vistas of the gorge and surrounding mountains. Your room is equipped with air conditioning, private bath with hair dryer, in-room safe, mini-bar, TV, and phone. Located in the main square in historic Úbeda, this parador is a former 16th-century Renaissance palace that has been converted to an intimate and lovely lodging. A beautiful inner courtyard highlights the parador’s public rooms; other amenities include a restaurant featuring Andalusian specialties, a bar, laundry service, and Internet access. High-ceilinged guestrooms have air conditioning, private bath with hair dryer, safe, mini-bar, TV, and phone. This old-world style hotel is located in the Salamanca neighborhood, near several of Madrid’s most prestigious boutiques. The hotel features a swimming pool with terrace; internet access; laundry and dry cleaning services; wellness center with sauna and massage; hair salon; snack bar; and two restaurants, including a Michelín-rated Japanese restaurant and a grille room. Fully air-conditioned guest rooms feature private bath with hair dryer, safe, mini-bar, TV, and phone. Built in 1952, Hotel Avenida Palace stands in the heart of Barcelona and offers a good location from which to explore. The 151-room hotel is just minutes from La Ramblas, the Picasso Museum, and the museum housing the works of modern architect Antoni Gaudí. The hotel features restaurant and bar, wellness center, fitness room, laundry and dry cleaning services, and Internet access. Air-conditioned guest rooms are fully equipped with private bath with hair dryer, safe, TV, and phone. Enjoy this bustling seaport, Spain’s cultural and commercial capital, with its medieval Gothic Quarter and popular Ramblas waterfront promenade. Irwin’s brief, indispensable guide introduces the stunning Moorish palace and fortress complex, revealing its mysteries, myths and significance with wit and insight. This superb, colorful guide covering all of Spain features bright photography, dozens of maps and a region-by-region synopsis of the country’s attractions. A handy folded, laminated street map of Lisbon in full color at a scale of 1:8,000. A detailed map of Madrid at a scale of 1:10,000, laminated and folded for easy reference. Jules Stewart sketches the history of a beloved city from Mayrit to Madrid, the Bourbons, Franco and beyond. With suggested whirlwind itinerary for Madrid in Two Days (and Nights). A lively, illuminating portrait of the Andalucian Kingdom, its cultural achievements and religious tolerance from the eighth century to 1492. A wonderfully readable, sweeping tale of splendor and tragedy, first published in 1866. A pocket-size encyclopedia, this slim book is an illustrated overview of the life and times of Goya. It’s an illuminating portrait of 18th-century Madrid. In this best-selling travelogue, Michener presents a compulsively readable and well-observed account of his love affair with Spain and all things Spanish. It has achieved the status of a classic, rich in detail and insightful. Stewart’s memoir about moving with his wife to a farm in Alpujarras is charming and insightful. Unlike many expatriates, Stewart manages to ground himself far enough into the community to make lasting friends – as well as a home for his young daughter. A selection of poems and prose in celebration of Granada, where Frederico Garcia Lorca was raised, studied and spent much of his short life. This lyric portrait of life – and the little donkey, Platero – in a remote Andalusian village is the masterpiece of Juan Ramon Jimenez, the Spanish poet awarded the 1956 Nobel Prize for Literature. Hemingway’s great novel, which encapsulates the angst of the post-WWI “Lost Generation,” is the story of unmoored American and British expats travelling from Paris to Pamplona.